More than thirty years ago Jim read a book, The Magus, by John Fowles. The old man turned up the lamp to better show a photo. Jim liked the concept enough to purchase an Aladdin kerosene lamp. Aladdin still fits their kerosene lamps with silk mantles and the white-hot illumination is silent and intensely bright, if you raise the wick. But you don’t unless you want to reveal something by the light. The lamp otherwise quietly and warmly provides background illumination. Until you raise the wick — then the light power is really on. We’d not heard the turn of phrase but found it very appropriate for our DC power project. This started a few weeks ago upon our return from QuartzFest [LINK TO BLOG RE QUARTZFEST] in the Arizona desert. Our battery power was great whilst gaining solar power and until we use lighting or fans or the water pump. And the battery power seems to sag and gradually return less and less throughout the evening. The fix is simply new and more storage batteries. Jim has long considered increasing our battery bank from two to four. Four years ago he changed our second or third pair of troublesome and short-lived 12v batteries to a pair of 6v golf cart batteries. These well outlasted the 12v batteries although some of the credit, no doubt, goes to the much improved PDI Intellipower converter charger. Our old converter charger apparently boiled out our batteries in short order, necessitating annual replacement of the 12v rv-marine batteries. 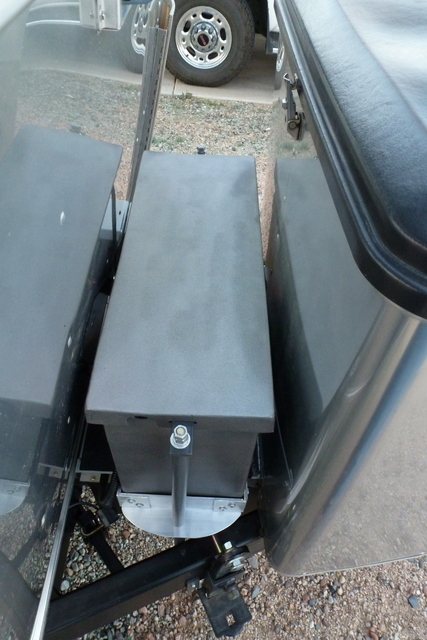 Soon after switching to a pair of 6v golf cart batteries (U2200 Interstate) Jim also switched us to the new and much superior PDI Intellipower 60 amp converter charger. The new converter charger has float rate charging to maintain full batteries without overcharging and has a boost rate to more quickly bring the batteries up to speed when they are low. But our two 6v golf cart batteries never seemed to have much depth. We’re great during the day with sunshine bathing the solar panels and feeding the batteries. After sunset the battery drain starts. Read a little, wash some dishes, take a shower, run the furnace a little while, and there’s not enough to run the ham radio at full power. The two 125 watt solar panels can, by 10 a.m., return our batteries to full charge. We enter the float charge stage on the solar charge controller, where it drops the charge rate to keep the batteries from going more than 14 volts. 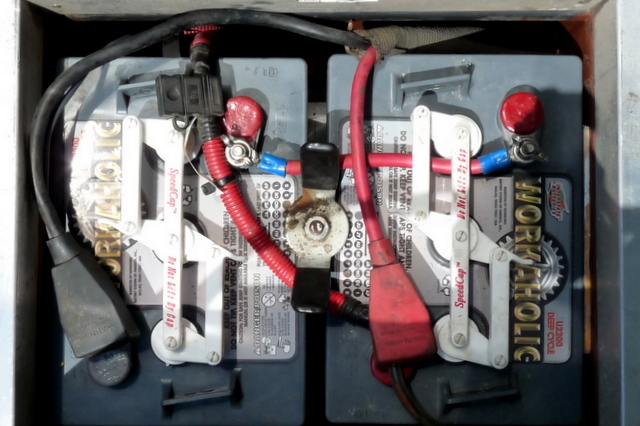 Two issues cause this battery drain: four year-old batteries and only 225 amp hours capacity even when they were new. Our new batteries are 464 amp hours, attained by wiring two series pairs of 6v 232 amp hour batteries in parallel. Jim wired these with four identical length #4 battery cables to optimize the load balance between all cells. 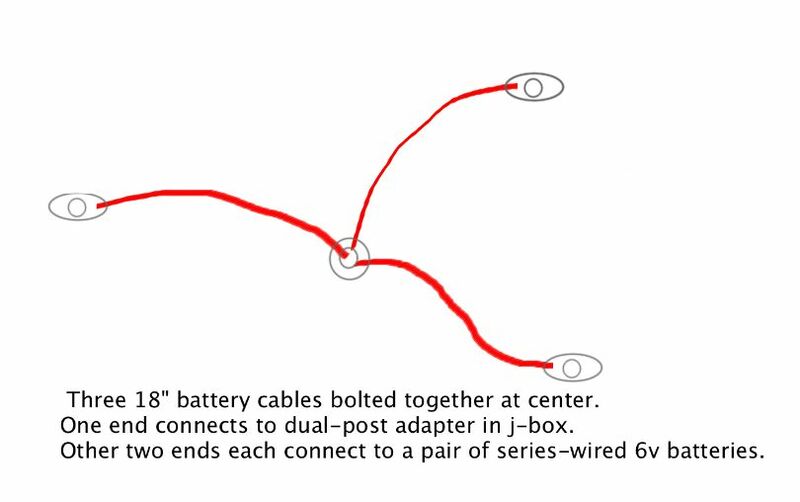 Although the Airstream’s original battery cables were #6 welding cable Jim decided instead to buy #4 battery cables. Welding cables are intended for portable use and a different set of requirements than cables for stationary batteries. Welding cables need to remain flexible and easy to coil and store. Battery cables don’t need the flexibility or coiling attributes and, properly specified, SGT battery cable will provide self extinguishing jackets not found on welding cables. The current carrying capabilities of #6 AWG and #4 wire are, for our short cable distances, both adequate. The #6 wire is rated for carrying up to 120 amps, and is rated for voltage drop of 3% or less for our 8 feet total wire length from batteries to load (12 volt distribution panel). Our RV does not have an inverter (to convert DC to AC voltage). Our largest load is the amateur radio, rated at only 22 amps. We’re fine with either cable size unless we install a large inverter — then we would up the cable size. The connections for the batteries need to be tight, weatherproof, and free from scuffing. 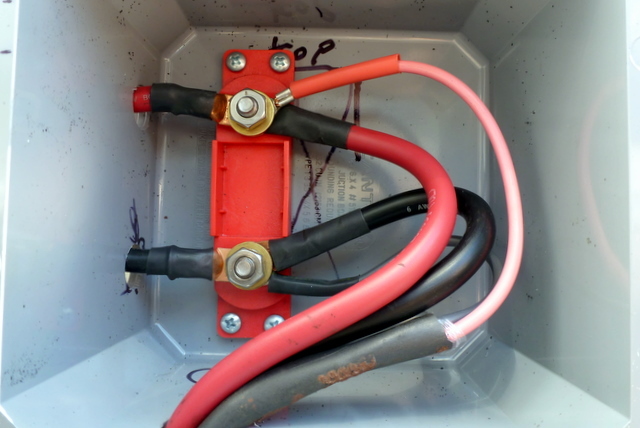 We make the main connections between house mains and battery mains in a 6 X 6 X 4 pvc junction box mounted to the trailer’s front exterior wall. We found a nifty fuse holder with two 3/8″ posts, brass washers and lock washers and nuts. Without the fuse it becomes a sturdy dual-post terminal for our positive and negative cables in the j-box. Jim found a polyethylene battery box from All Battery Co which fits nicely over the original battery box. But how to clamp it securely for travel? We devised a hold-down which slides through slots in the lid and the box ends. All-thread attaches from small l-brackets on the trailer’s a-frame up to holes in the 1/4″ X 1″ X 24″ hold-down bar. Jim felt the battery box might still slide on top of the lower box. 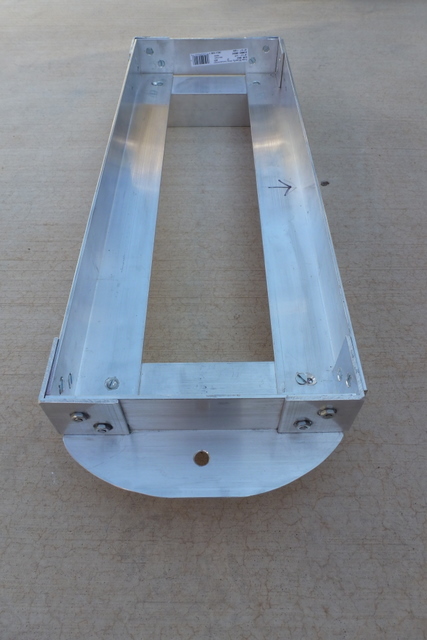 He devised a nice battery tray of 1/8″ X 2″ X 2″ aluminum angle. The corners are bolted together, a downward flange near each end keeps the tray from sliding left and right, and the all-thread centers through a flange at each end of the battery tray. The poly battery box nestles snugly in the tray. 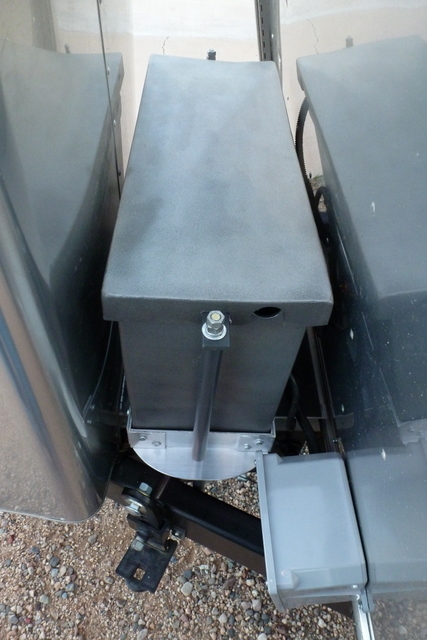 Since the two upper batteries in the poly box and tray will be a lot to remove (135 pounds comprised of two batteries, four battery posts, two hold-down bolts), we installed a battery watering system from Camping World. We have a quick-connect fitting outside the battery box and a squeeze-bulb filler to fill the lower batteries from a distilled water container. 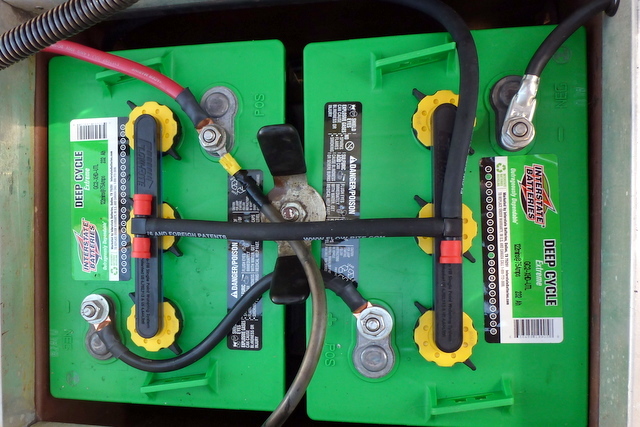 When the upper batteries need water we will also address the lower batteries and without needing to remove the upper batteries first. We have dry-camped various times over the past several years and have never had the luxury of a little spare battery power. Typically we would have seen 12.2 or 12.4 by bed time and the same low reading the following morning. The furnace could draw hard on the pair of batteries, the fan running noticeably slower than normal. And the lights would dim as the evening progressed. The results from switching to four 6v golf cart batteries instead of only two have been very gratifying. We have run over two weeks on solar only and the batteries have remained strong throughout the day and night. Initially we babied them out of habit. Then we tried running as many lighting circuits as we might when plugged into shore power. No problem, the batteries might show 12.4 or 12.6 before bed time and by morning we’re again starting at 12.8 to 13.0. This is a great improvement. Arizona has over 300 days of sunshine every year. We’ve had only two or three cloudy days in four months. We probably won’t, until we leave here, learn how the batteries do on the second day or third day without sunshine. Worst case, we have the 1KW Yamaha generator. We won’t, however, be surprised if the batteries hold just fine for several days. 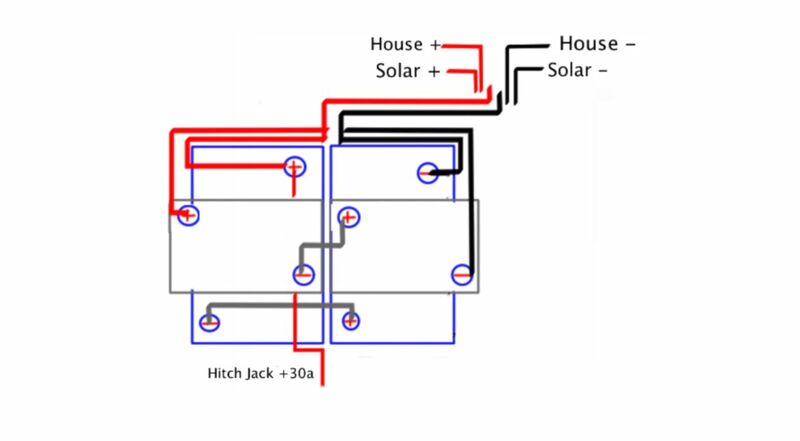 When Jim recently described his planned changes to DC storage battery, cabling, and solar panels to friend Jack AA8Q, Jack stated, “Fine business on raising the wick on your DC power system”. Yeah, it’s definitely brighter now. Now if only the truck can tow the extra 135 pounds . . .